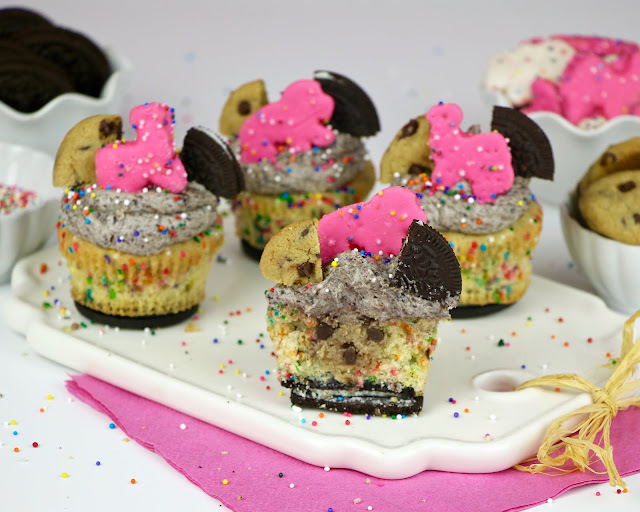 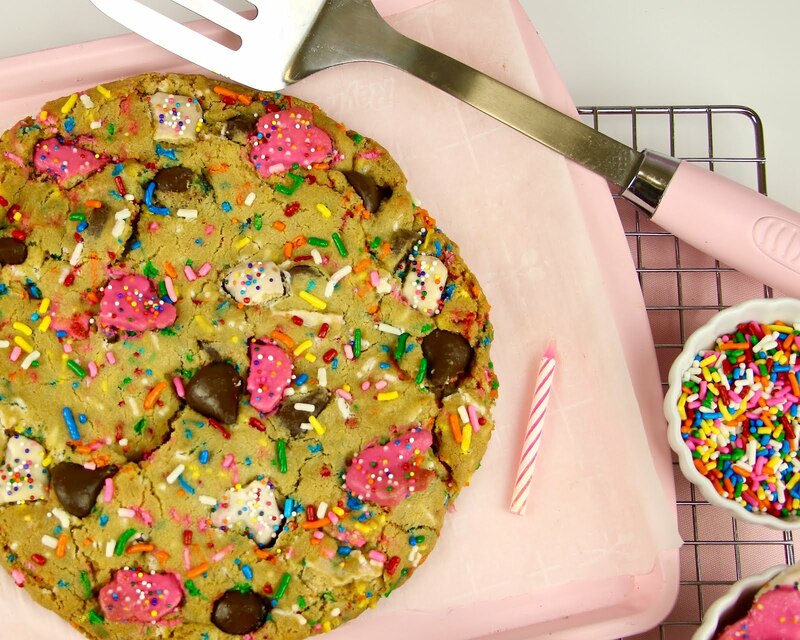 The most over-the-top cookie ever. 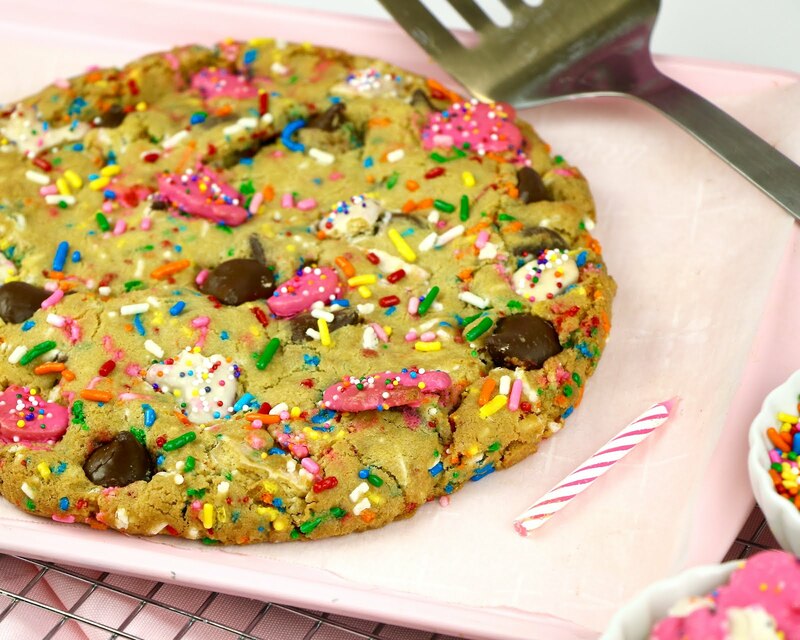 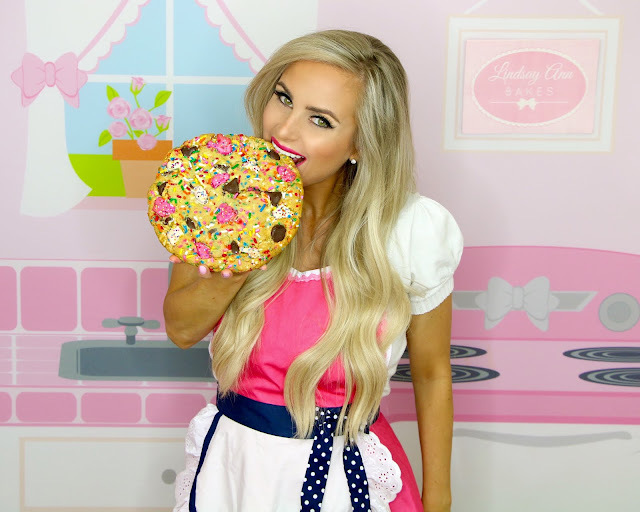 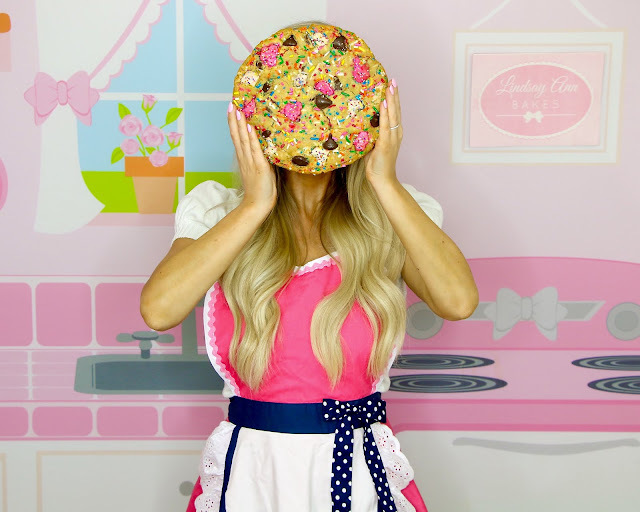 Imagine a ginormous cookie the size of your head, studded with XXL chocolate chips, that tastes just like buttery, sprinkley, funfetti cupcake, yesss! 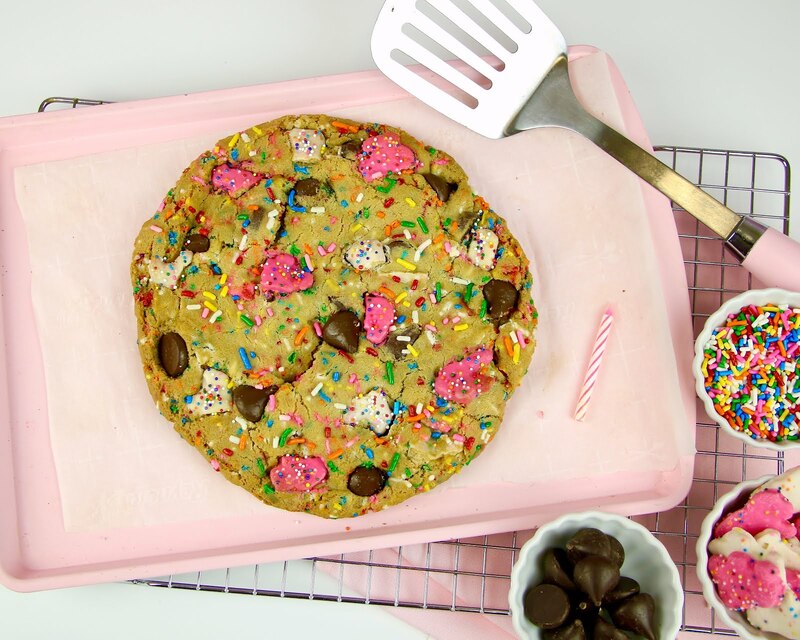 This cookie is the ultimate celebration cookie. 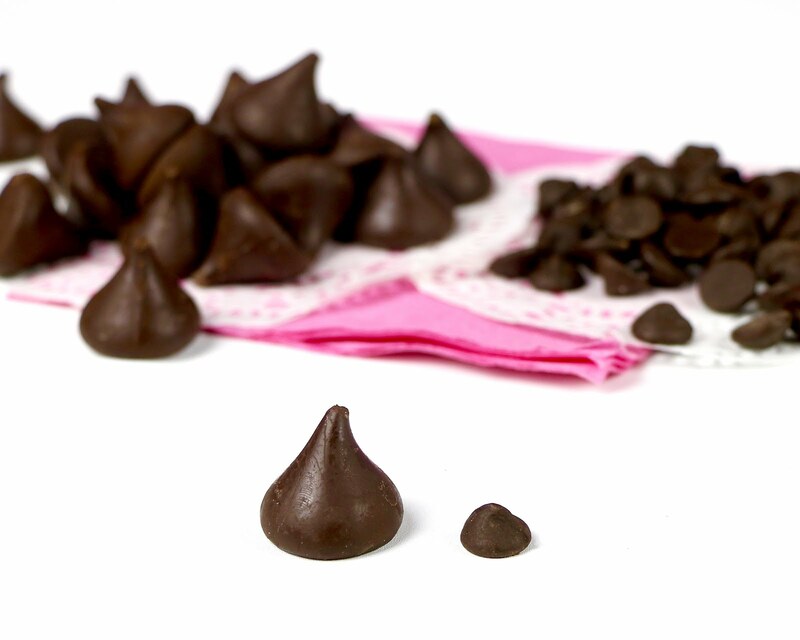 I thought the dark chocolate kisses were the perfect jumbo version of the classic semisweet morsels in a regular cookie. 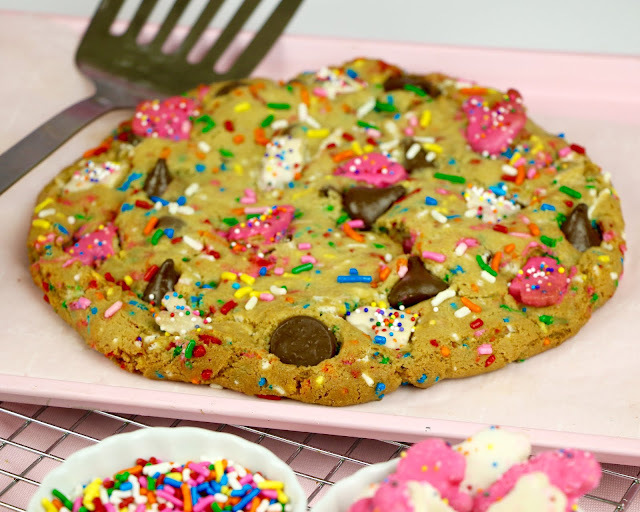 How perfect are these as giant chocolate chips for the giant chocolate chip cookies?! I also made the dough taste just like a funfetti cupcake without even using any cake mix, by adding my secret combo of flavor extracts, rainbow sprinkles, and of course, frosting, in the form of some frosted animal cookies. 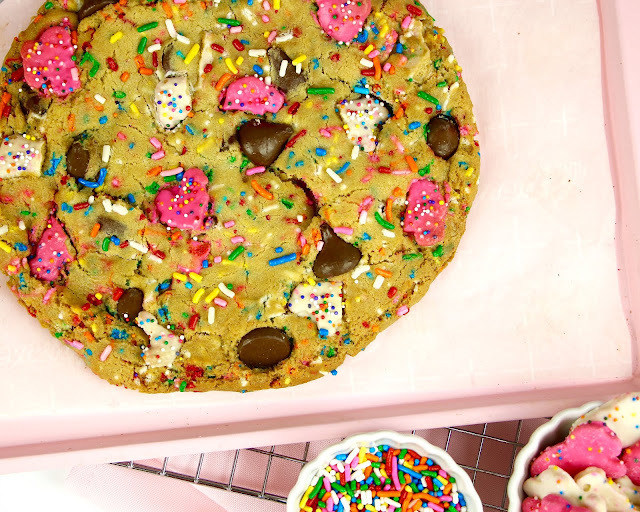 Also, instead of using a whole egg, which would make this cookie, way too cakey, I used just the yolk with a little milk, to make this cookie extra soft, moist and rich. Look how big this thing is! This cookie would be perfect for a birthday treat or a special celebration gift. 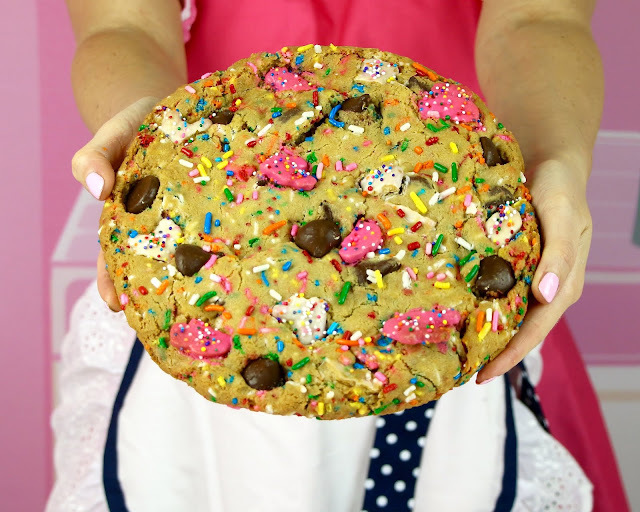 I mean, who wouldn't love getting this giant cookie for 1, to devour?! 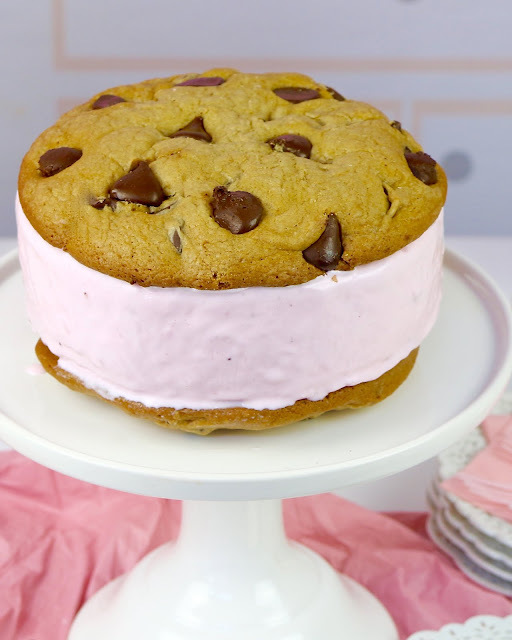 ...or my Giant Cookie Ice Cream Sandwich, so be sure to check those videos out too! 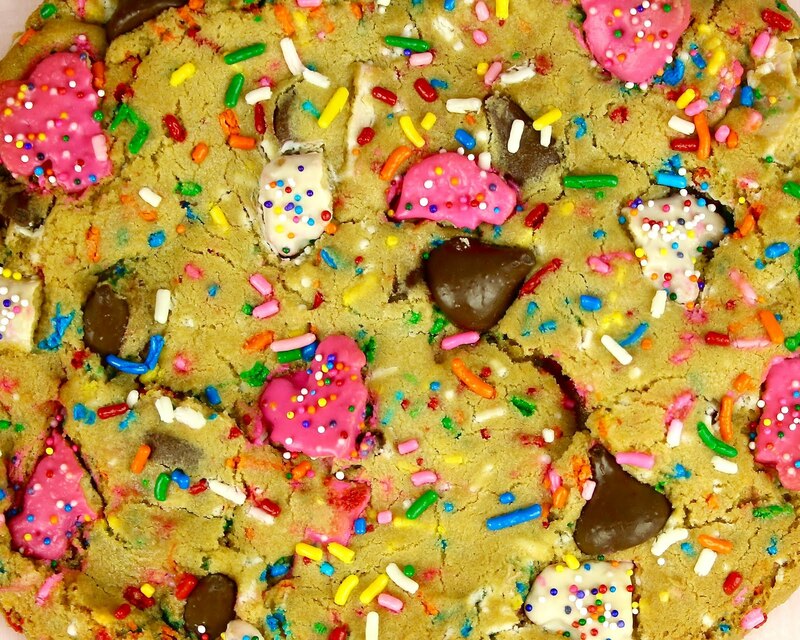 Preheat oven to 350 degrees F. With an electric mixer, beat together butter and sugars on medium speed for about two minutes. Add the egg yolk, milk, vanilla extract, butter extract and almond extract. 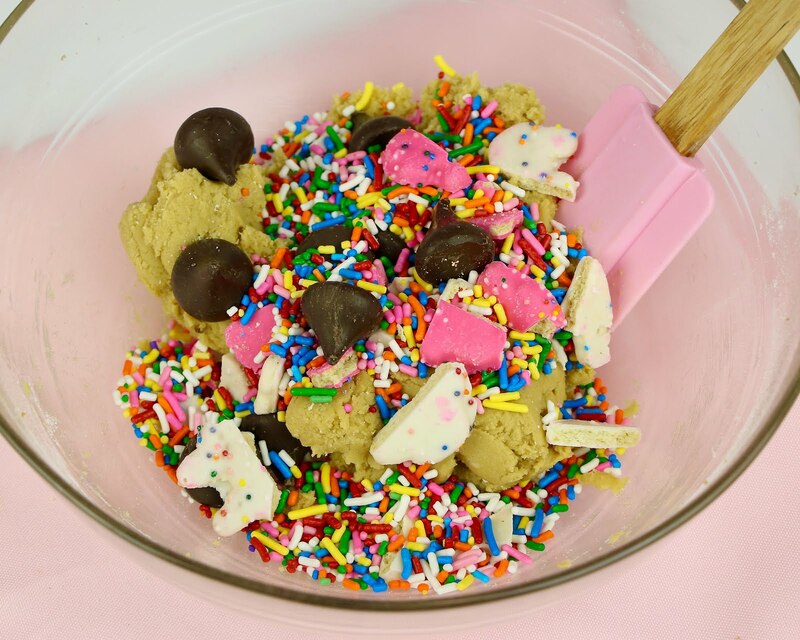 In a small bowl, whisk together the flour, baking soda and salt and add to mixing bowl, just until incorporated. Fold in kisses, animal cookies and sprinkles. 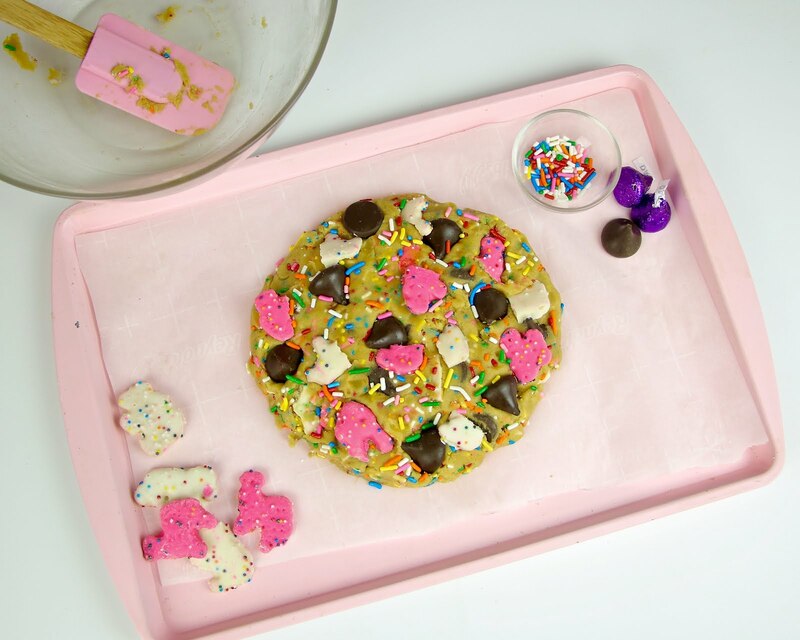 Press dough into a 7" wide disk on the the center of a parchment lined baking sheet. Place remaining kisses, cookies and sprinkles on top. 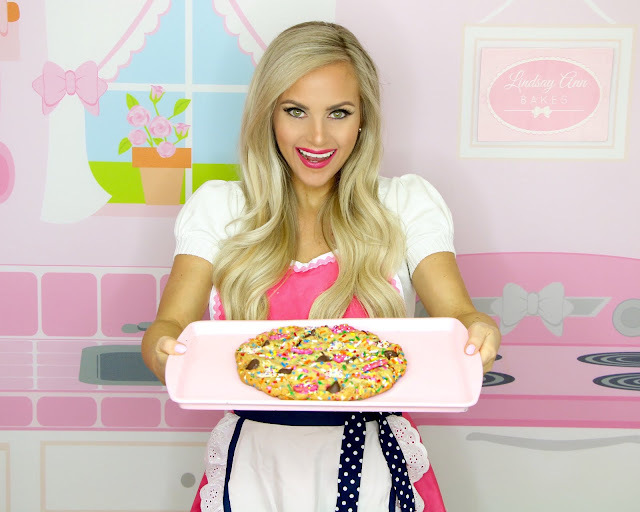 Bake for about 20 minutes, until edges just start to turn golden brown. 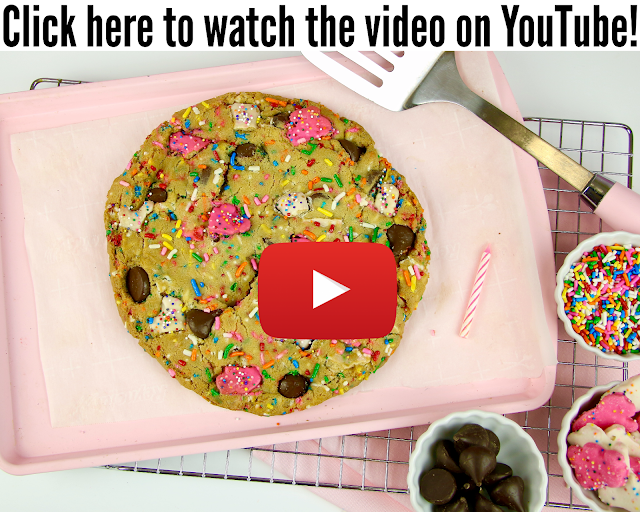 Cool on baking sheet for 5-10 minutes, before transferring to a wire rack to cool completely. 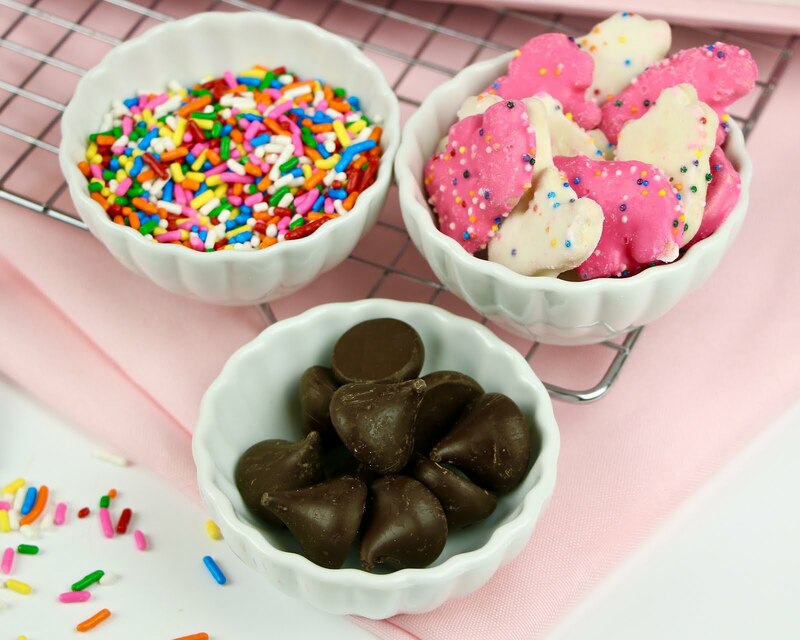 Serve immediately, or store at room temperature in an air tight container.